Oh my goodness, these Pumpkin Pie Biscuits are heavenly. Every morsel just melts in your mouth. I loved these biscuits and can’t wait to make them again! 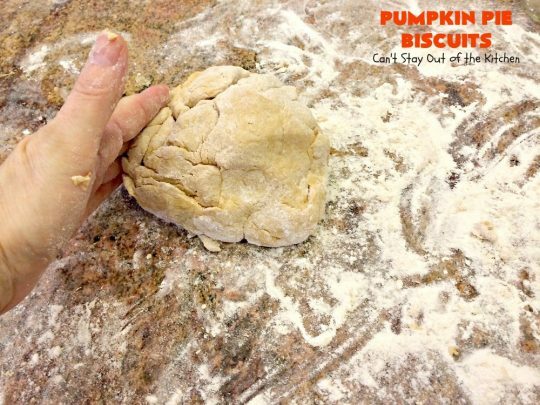 Pumpkin Pie Biscuits have sweet, fragrant, Pumpkin Pie flavors with cinnamon, ginger and pumpkin added to biscuit dough. They are just amazingly wonderful. 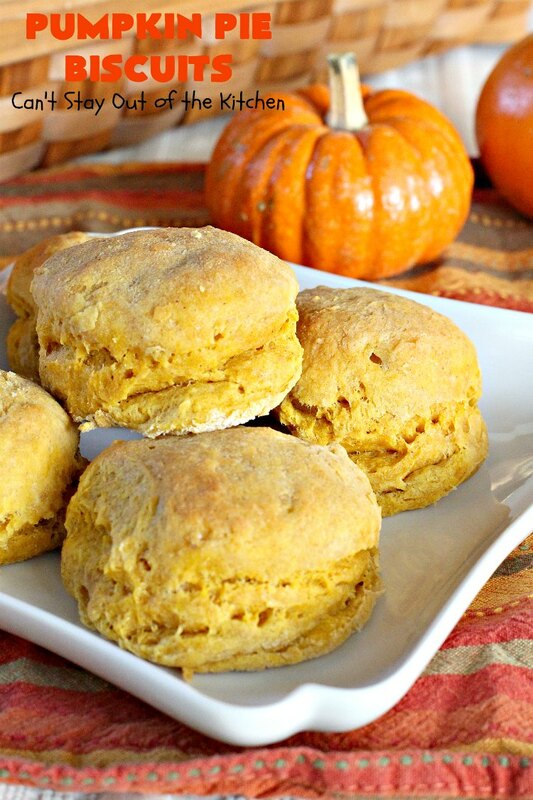 I think Pumpkin Pie Biscuits would make an amazing addition to any Thanksgiving menu or other holiday dinner. 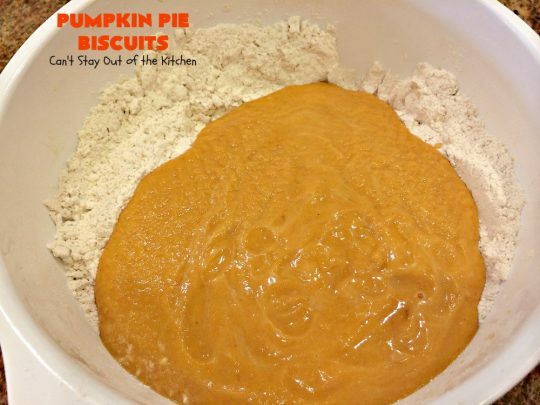 One of the reasons I really wanted to make this recipe is that it uses more wholesome products than a lot of biscuit recipes: these use butter instead of shortening and honey instead of sugar. The only way the recipe can be made healthier is by using home ground sprouted wheat berries. 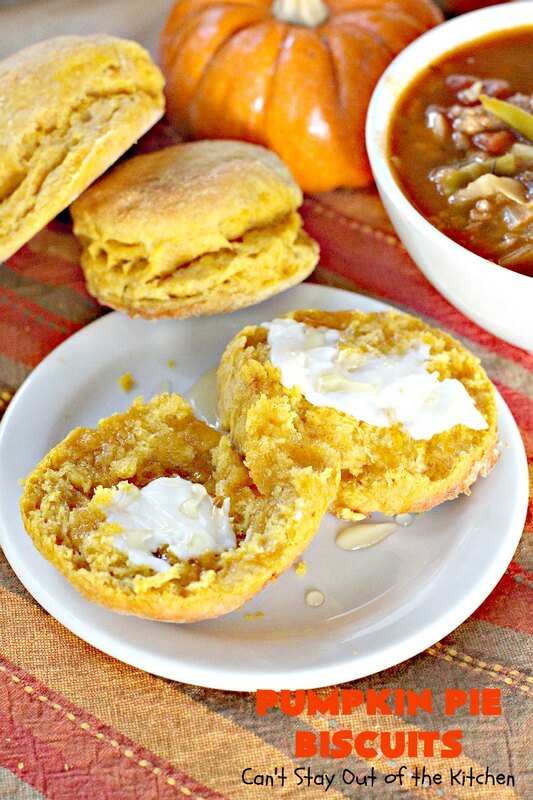 Okay, granted, I’m a sap when it comes to homemade bread, cornbread, rolls, muffins or biscuits. I love all of it and can sit down with bread and biscuits with jelly or honey and enjoy that as much as a decadent dessert! Crazy, right? 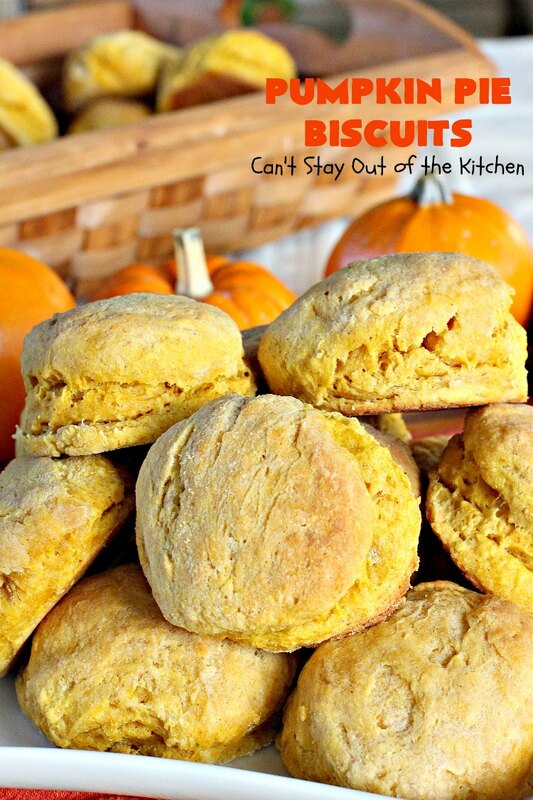 So when I saw these biscuits on Pinterest last week, I knew I had to make them–soon! I am so glad I did. This post has a lot more pictures than most, because I’ve tried to guide you through the process of “kneading” or getting the biscuit dough ready to cut and put into the pan for baking. I have a couple of recommendations. When I rolled out the dough (actually I patted it into shape), I made it a full one-inch thick. If you love biscuits and aren’t adverse to trying something a little different, then I highly recommend Pumpkin Pie Biscuits. 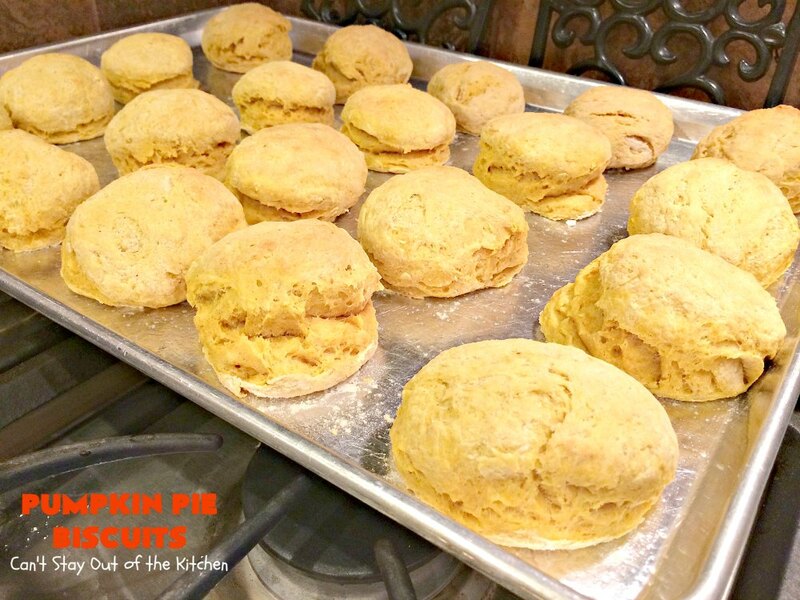 They will remind you so much of Pumpkin Pie in biscuit form! I urge you to try either my Sweet Potato Biscuits or these Pumpkin Pie Biscuits for Thanksgiving dinner or to make with your leftover turkey when you make Homemade Turkey and Dumplings afterward! 🙂 Either way, you can’t lose. Pumpkin Pie Biscuits taste like eating Pumpkin Pie but in biscuit form! I preferred mine with butter and drizzled with honey. 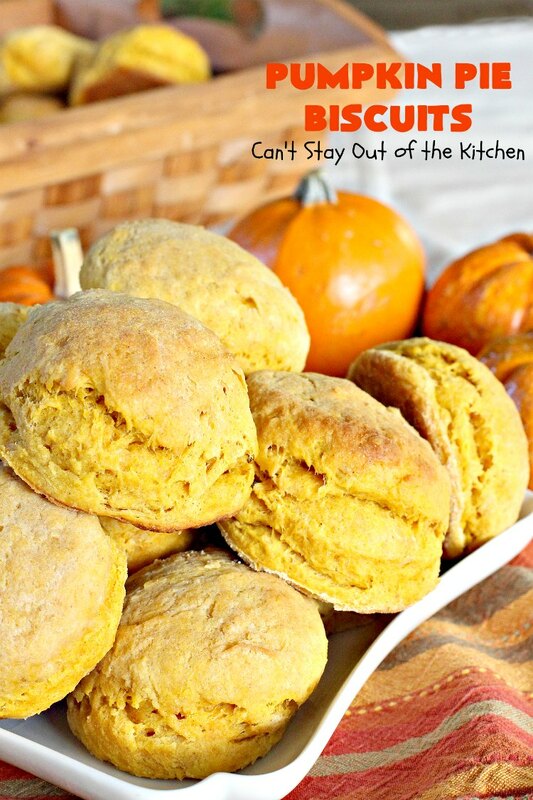 Pumpkin Pie Biscuits are a great side for Thanksgiving dinner or other holiday menus. If you’re a biscuit lover, these are perfect for breakfast, lunch or dinner! I used these ingredients. 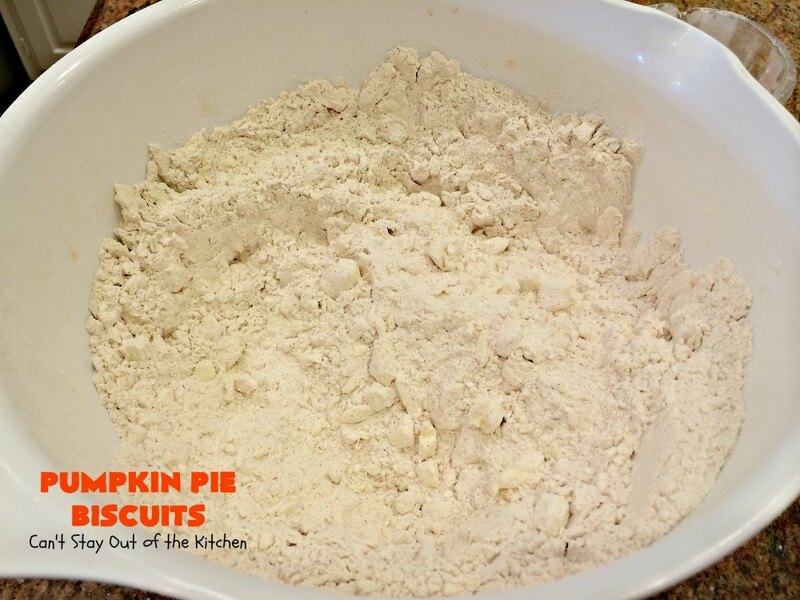 I made a double batch of this recipe so that we could have some for ourselves, and I shared about two-thirds of them with a family I was taking a meal to. Place flour in a mixing bowl. Add cinnamon and ginger and stir to combine. Blend butter with a pastry blender until coarse crumbs form. Here the butter has been cut into the flour mixture. Mix pumpkin, honey and buttermilk. Whisk to combine. 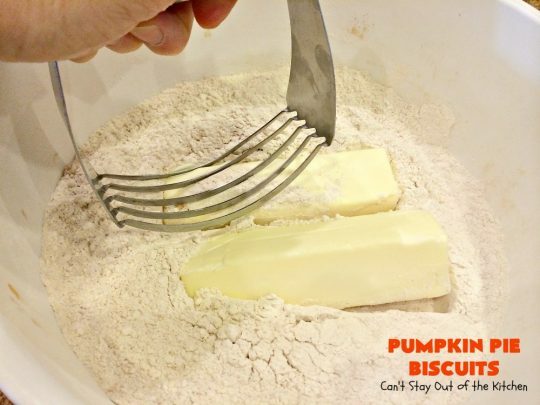 Add pumpkin mixture to flour mixture. Stir until combined. Mixture will be very sticky. 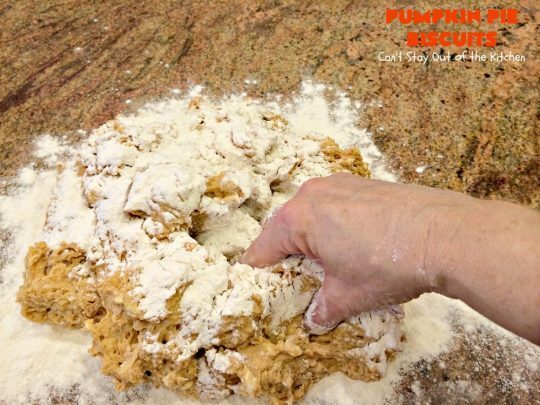 Spread a generous amount of flour on your countertop. Place biscuit dough on top and sprinkle heavily with flour again. Work flour into dough with your hands and finger tips. You can see how I’ve worked the flour into the dough with my fingers here. Keep working as much flour into the biscuit dough as you need to get it smooth and no longer sticky. I actually started kneading the dough to work the flour into the dough because that’s easier for me than just using my fingers. 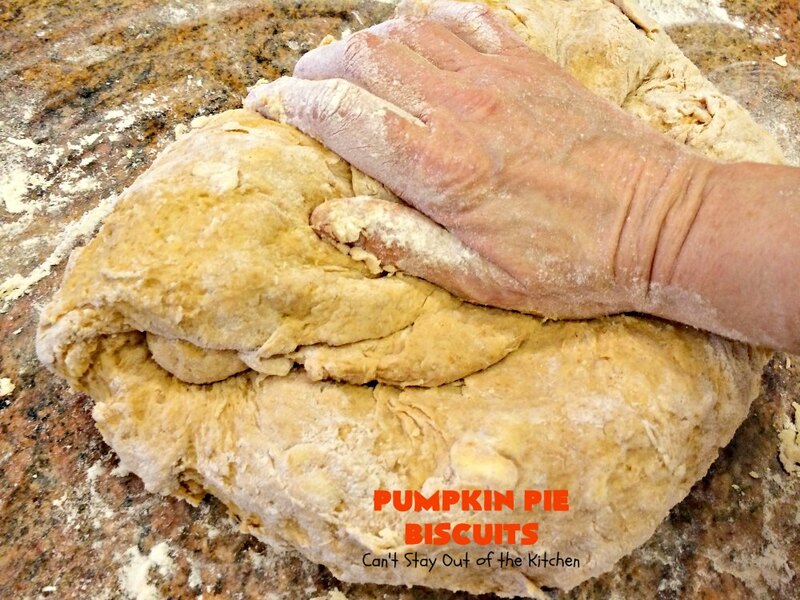 Pull the dough toward you with one hand, whisking flour into the dough with your other hand. I’ve worked most of the flour into the dough here. I made a double batch of biscuits and probably worked in at least two more cups of flour when it was all said and done! The dough was still sticky so I continued using my fingers to push flour into the center of the dough. Here the biscuit dough is finally about done. I smoothed it out and turned it over patting the dough into a circle. I did not roll the dough out thinly. This is at least an inch in height–maybe more in some spots. 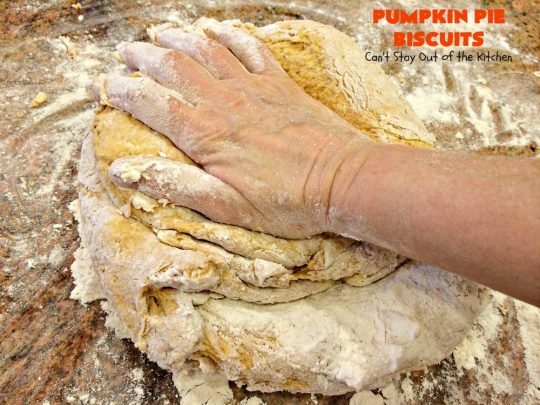 You want a nice thick dough if you want light and fluffy biscuits that don’t taste like heavy disks. Cut biscuit dough with a biscuit cutter. 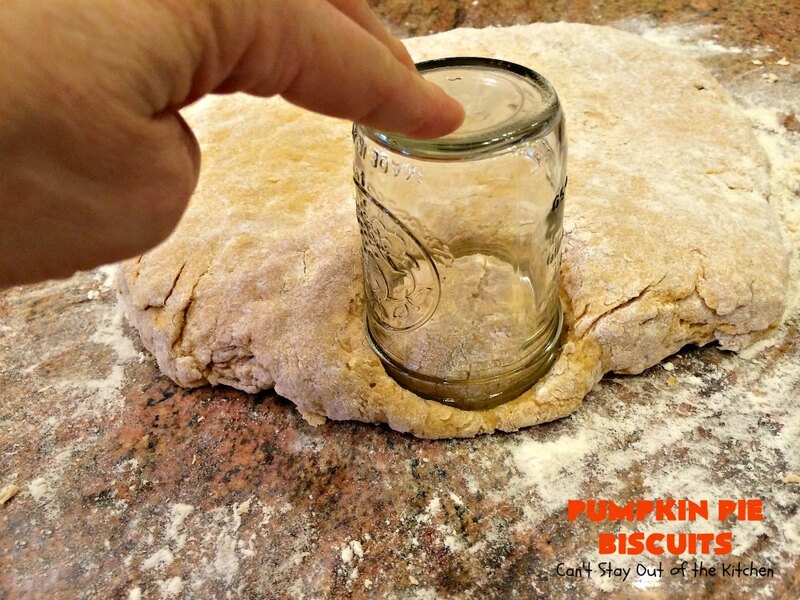 I used a small jelly mason jar because I don’t own any true biscuit cutters. Spray cookie sheets with cooking spray. Place biscuits on cookie sheet. 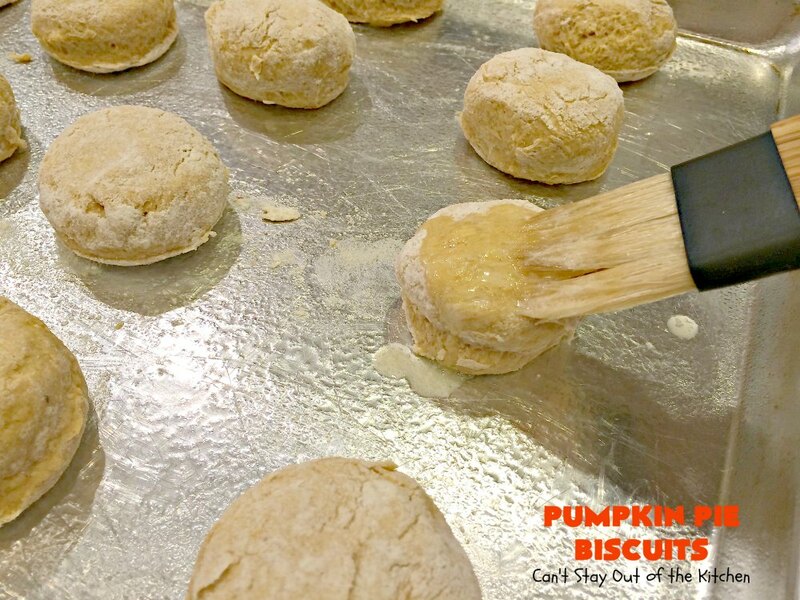 Melt butter and brush it on the tops and sides of each biscuit. This pan is ready for the oven. Here I’m putting all the scrap pieces together and I rolled them out and ended up with eight more biscuits ( I was making a double batch). 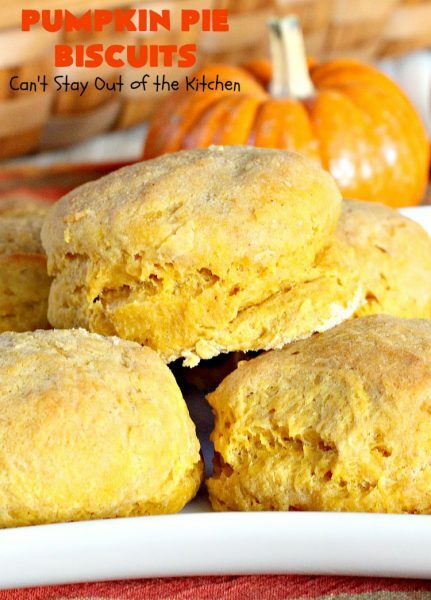 These will not be quite as airy and soft as the biscuits only rolled once, but they are still delicious nonetheless. Bake at 450 for about 15 minutes. Brush biscuits with more melted butter when they come out of the oven. 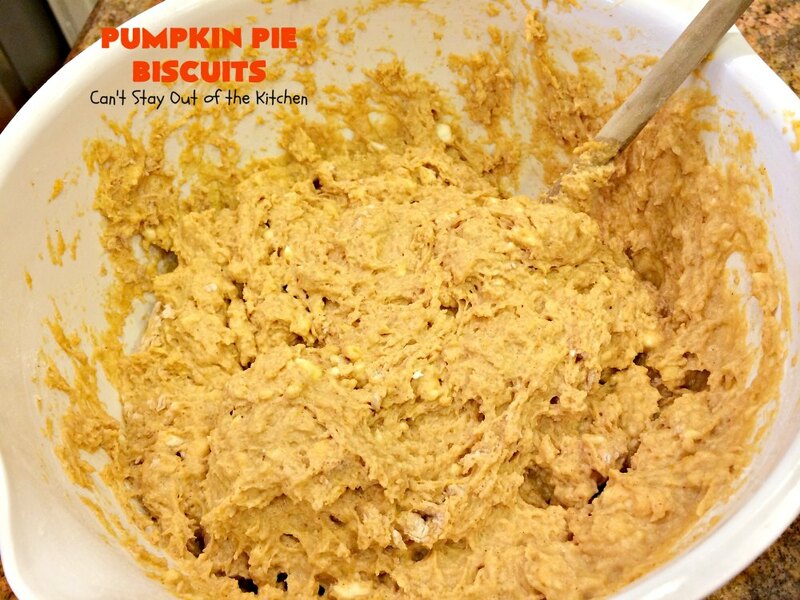 Serve Pumpkin Pie Biscuits with butter and honey if desired. This close up allows you to see the texture of each biscuit. 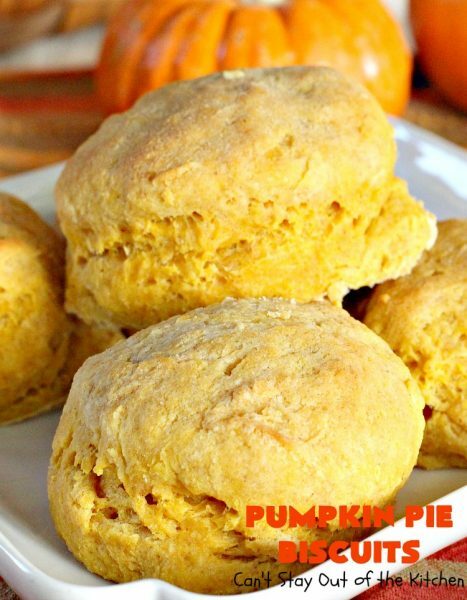 Pumpkin Pie Biscuits are wonderful served as a side to Homemade Turkey and Dumplings. 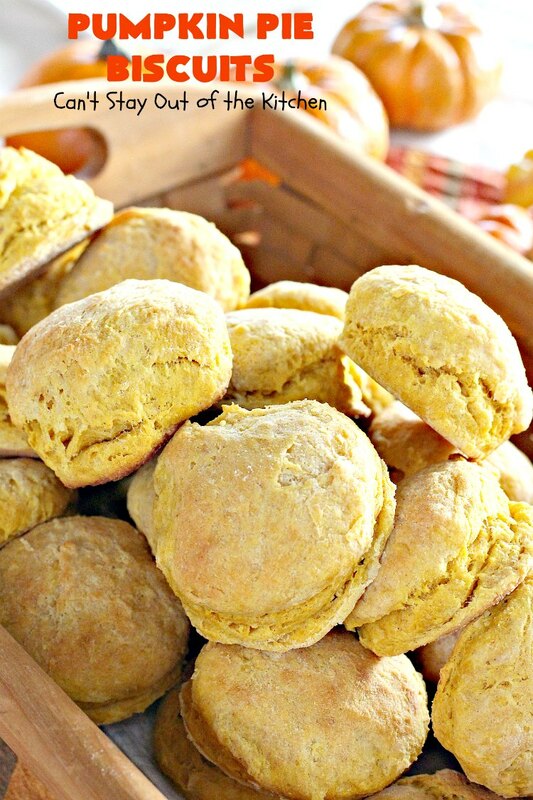 These biscuits are so awesome they can be served with anything–or just by themselves. 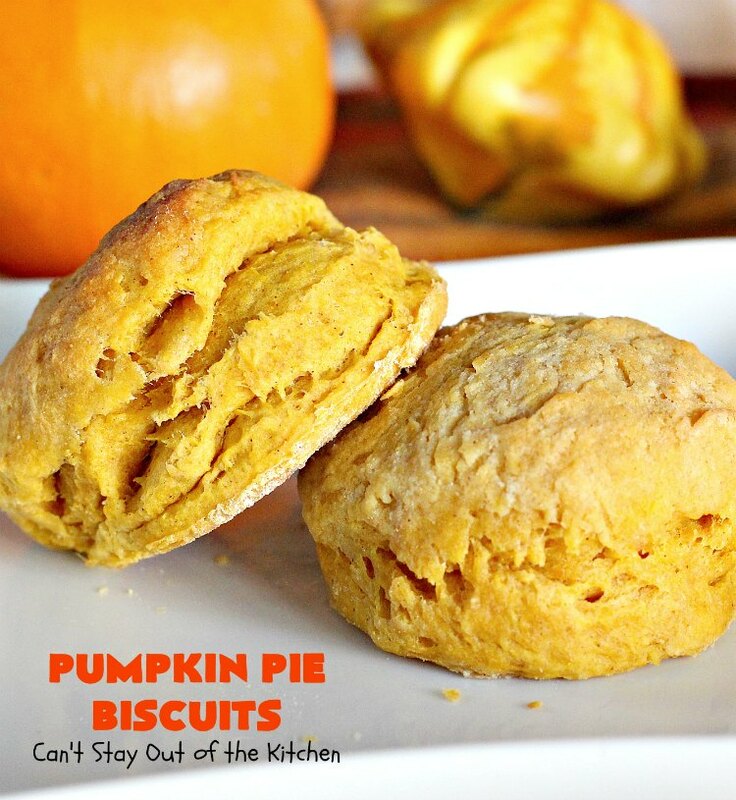 These scrumptious biscuits include ginger and cinnamon so they taste like eating pumpkin pie in biscuit form! These are wonderful served with butter and honey drizzled over the top. Great for Thanksgiving menus or other holiday dinners. 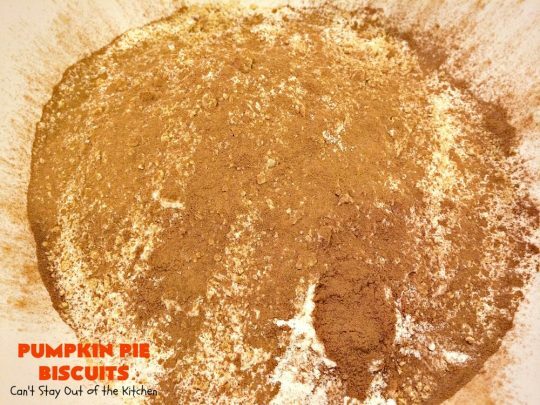 Mix flour, cinnamon and ginger in a large bowl. 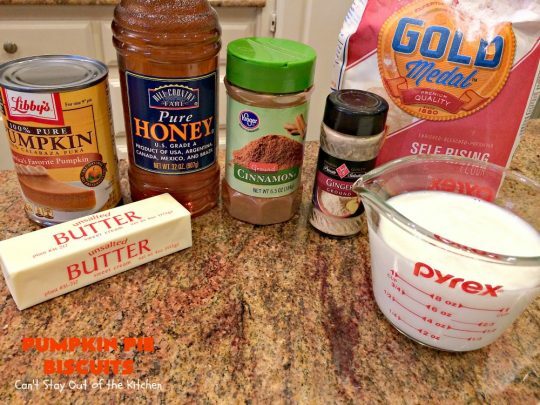 Whisk buttermilk, pumpkin and honey in a mixing bowl. 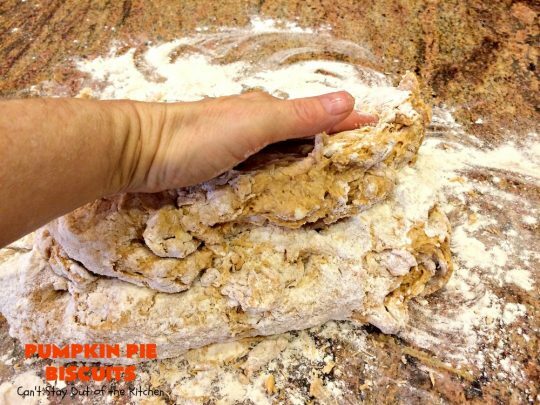 Add pumpkin mixture to flour mixture and stir with a wooden spoon until dough is mixed. Turn onto a very well-floured surface. Work extra flour into dough with your fingers and hands, adding more flour as needed. 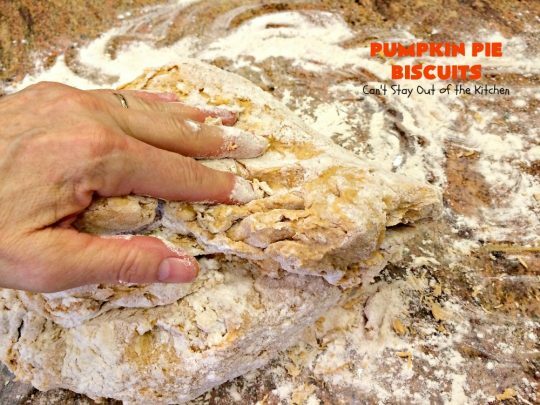 Work or knead the dough until the dough is no longer sticky. Roll or pat out the dough to a one-inch thickness. 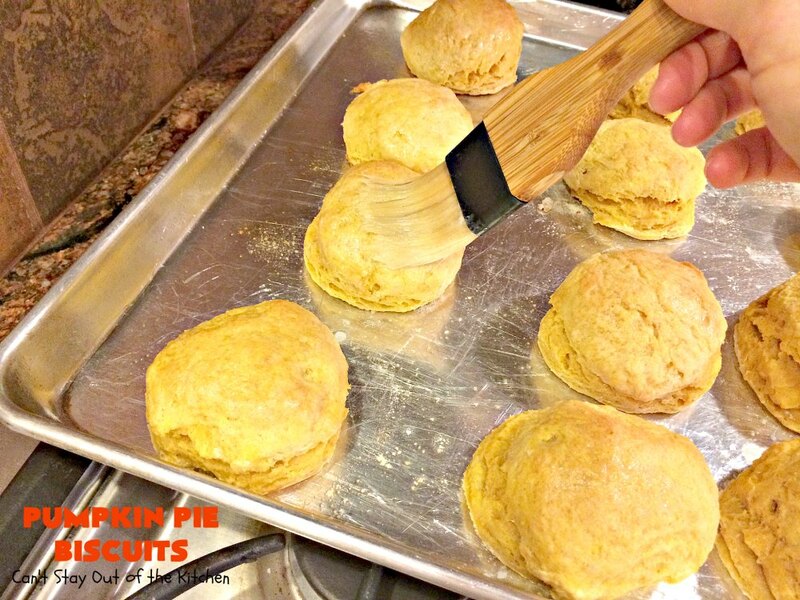 Cut biscuits with biscuit or cookie cutter that’s been dipped in flour. 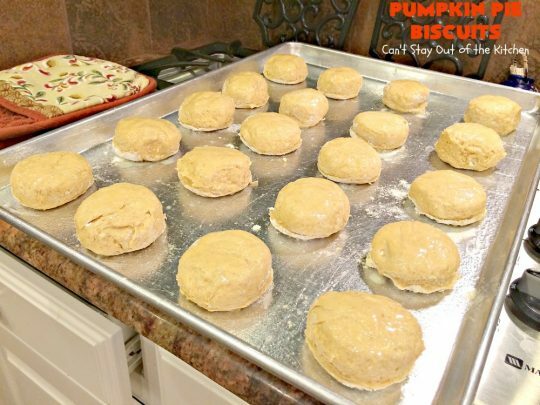 Place biscuits an inch or two apart on a greased cookie sheet. Brush tops with half of the melted butter. Bake at 450° for 15 to 17 minutes or until tops are golden brown. Serve with butter and honey, if desired. 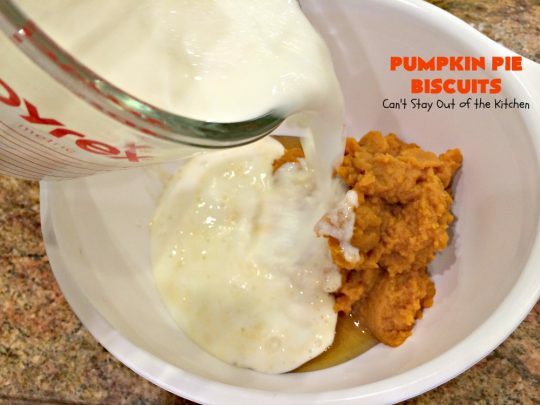 NOTE: To make buttermilk you can sour milk by measuring regular milk into a measuring cup. Add 3 tbsp. vinegar. Allow milk to sit out about 5 minutes until milk has curdled. 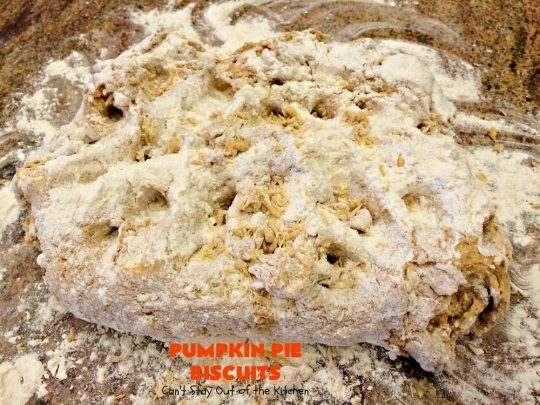 NOTE: I worked in at least an additional full cup of flour to get the biscuits of the right consistency when mixing and kneading the dough. To make buttermilk you can sour milk by measuring regular milk into a measuring cup. Add 3 tbsp. vinegar. Allow milk to sit out about 5 minutes until milk has curdled. [br][br]I worked in at least an additional [u]full cup of flour [/u]to get the biscuits of the right consistency when mixing and kneading the dough. 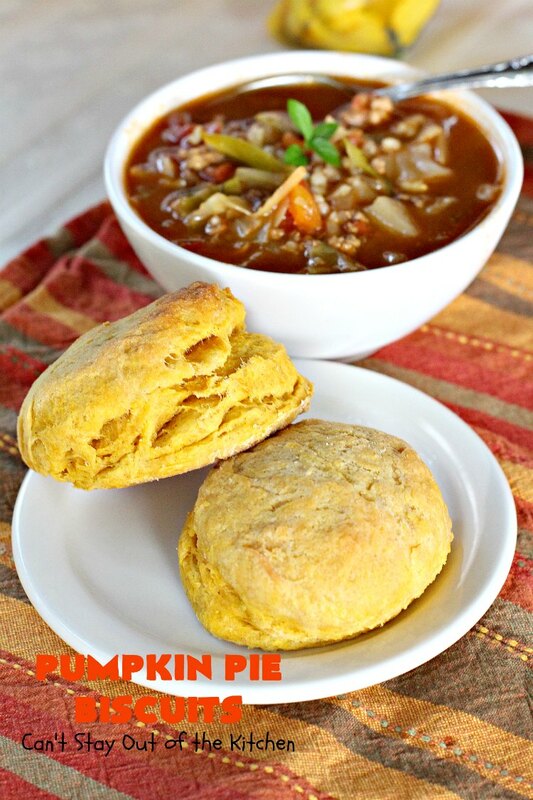 Pumpkin Pie Biscuits were a wonderful side dish to a bowl of hearty Cabbage Roll Soup. 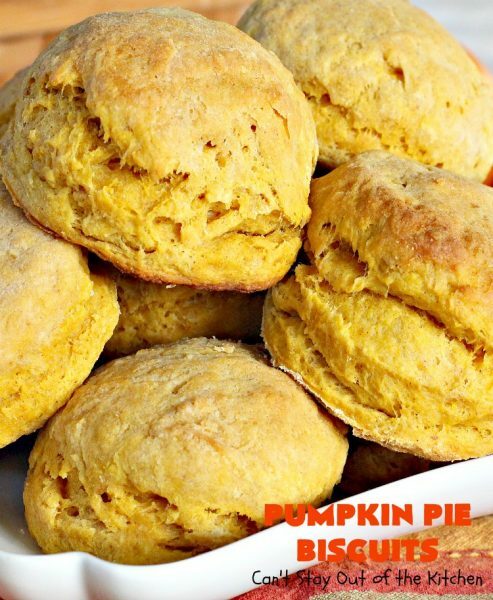 If you enjoy biscuits for breakfast, Pumpkin Pie Biscuits would make a wonderful holiday or special occasion breakfast. Serve them with assorted jellies, honey and butter. 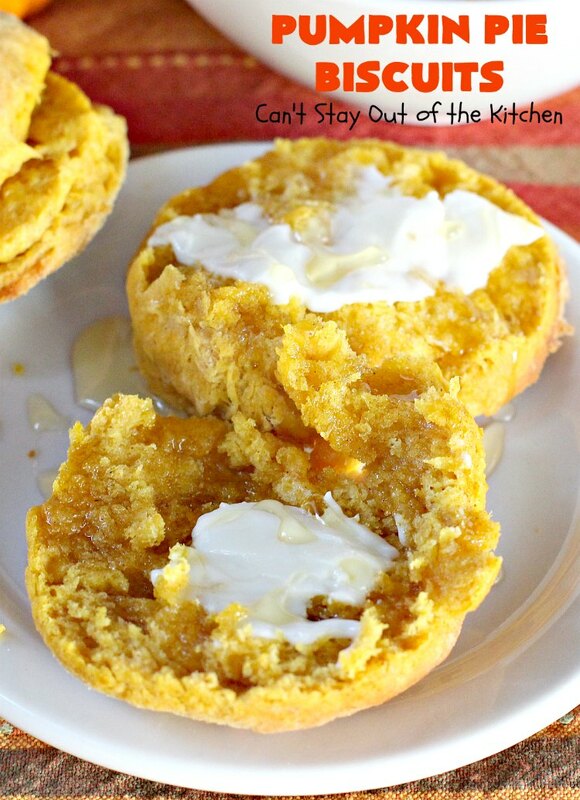 A little butter and honey make Pumpkin Pie Biscuits sensational! We LOVED Pumpkin Pie Biscuits and believe you will too! Hi, Judy. 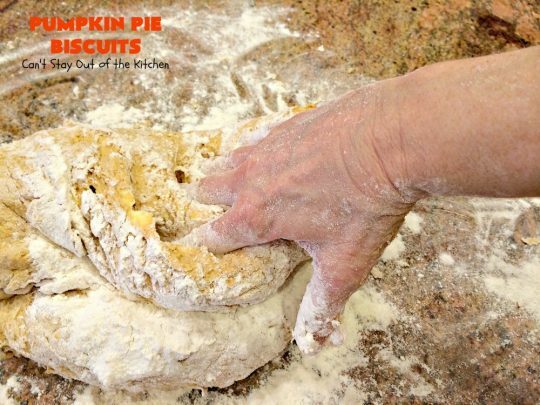 I will tell you a couple of things that may help: I don’t over-knead the dough, but I do work the flour in so that the texture is not so sticky. Also, I never roll out the dough very thin. 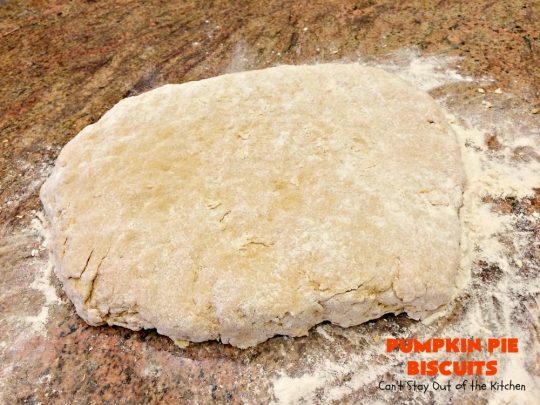 I usually roll out the dough so that it is at the very least, one inch thick – one and a half to two inches is even better. Using 3-4 tbsp. of baking powder also helps them rise sufficiently so they are not tough. Baking in a hot oven – 425-450 also helps. If they bake too long at lower temperatures, biscuits do tend to get tough. You can always try a basic texture several times (kneading different amounts of time) until you get the consistency you like. 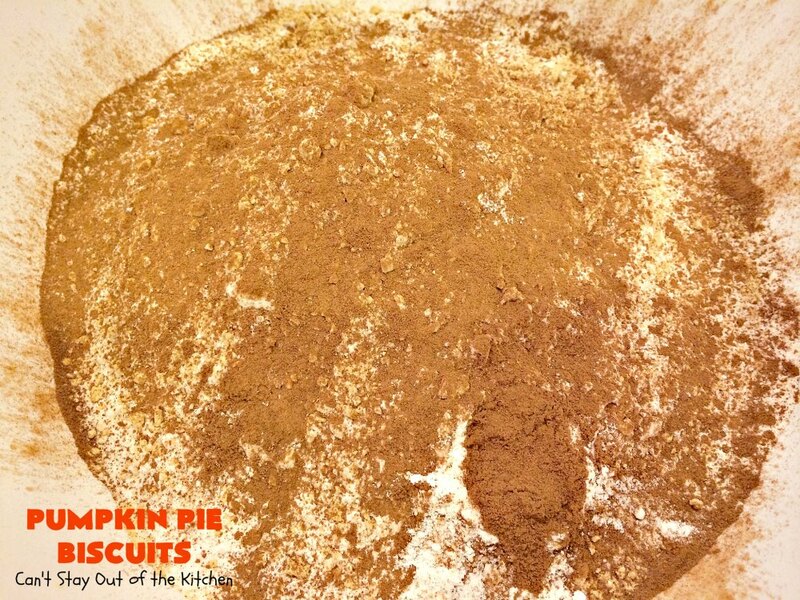 I always had problems with biscuits, too, until I started using the techniques mentioned above. I just love the idea of pumpkin pie biscuits! Thanks! They were so delicious.Thanks for stopping by.